Avalon Airport chief executive Justin Giddings believes the airport will survive even if Jetstar pulls its five flights a day to the Lindsay Fox-owned facility. The current agreement between Jetstar and the operators of Avalon Airport and the Victorian government that was signed in December 2013 and understood to be worth about $11 million is due to end at the end of April. The Qantas subsidiary and the state government are in discussions about a new deal and Victorian Premier Daniel Andrews told reporters on Wednesday he was open to offering Jetstar and Avalon Airport a fresh support package to ensure the airline continues to fly to the airport. Andrews said any new support package would have conditions attached that called for more flights to Avalon, which is located about 20km from Geelong and 55km from the Melbourne CBD. It was understood Jetstar’s five Sydney-Avalon services a day were loss-making for the airline. 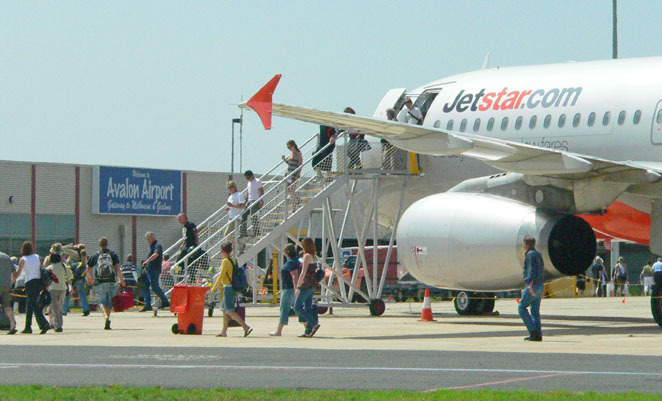 Jetstar first started flights to Avalon in 2004 and is currently the only airline offering flights to the airport. Qantas recently closed its Boeing 747 maintenance, repair and overhaul facility at Avalon. Giddings said there were between 500,000-600,000 passengers year that arrived in Avalon on Jetstar flights. Moreover, about eight million travellers have flown on the airline’s Avalon services. While Giddings acknowledged the threat of Jetstar leaving was serious, he stressed the airport did have a future regardless of Jetstar’s decision as a freight hub, an industrial centre or even with other carriers coming in to replace Jetstar. “I think Avalon Airport’s future for the medium to longer term is fantastic,” Giddings told Melbourne radio station 3AW on Wednesday. “You look at the major cities around the world and all of them really have two good airports. Tigerair Australia also flew to Avalon when it was known as Tiger Airways Australia between 2010 and 2011 and could be considered as a replacement for Jetstar should it choose to cease operations at Avalon. “From a Tiger perspective we will continue to evaluate different opportunities as things unfold, if they unfold,” Virgin Australia chief executive and Tigerair Australia chairman John Borghetti told reporters in Sydney on Wednesday. Tigerair is 100 per cent owned by Virgin. Giddings said the airport was “hopeful that we can get another carrier in if Jetstar go”. “We’d love to get Tiger in. I think Tiger, this is a natural airport for them, it’s low-cost airport and it is an airport that they can operate freely in with good infrastructure and I think it would be wonderful,” Giddings said. In a country with debt and deficits at all government levels one wonders the wisdom of a government subsidising flights that apparently otherwise are not commercial. It is a different story if we are talking about remote communities and the need to maintain essential services…. The problem with Avalon is that there is still no rail service, buses and taxis are expensive and therefore not a viable option for budget holiday makers and hire car operators charge a premium fee due to the location. It’s one thing to offer cheap airfares, but if the travel to/from the airport expensive, it will force people to go elsewhere. So Jetsatr flies to Avalon 5 times per day from Sydney. This is not profitable. Services to other destinations are also not profitable. So in response, the Victorian Government is proposing to provide Jetstar with a financial incentive to not only maintain the number of services currently operating from Avalon (that people don’t want) but to increase the number of services (that people don’t want). Is this seriously a good way to be spending taxpayers money? The next question is – if Jetstar withdraw and Tigaerair decides to replace Jetstar, how long will it be before Borghetti has his hand out asking for more money to maintain the services? Avalons fantastic for the Geelong and Werribee people, especially during peak hour where Melbourne freeways blow your travel commute extensively. I just cant fly AVV-PER…and flying through Sydney with Jetstar isn’t viable. Get Qantas in and i’ll use it! Avalon is great if you’re driving from Geelong, Werribee or South-West Victoria and want to fly a LCC to Sydney. Anything else and it’s not a realistic option compared with Tullamarine. I think there is ample population between South Western Melbourne, Geelong and SW Victoria (Colac, Warrnambool) to make a go of it. Perhaps some destinations other than Sydney might be an idea. A Gold Coast flight given the surfing culture in both regions for example? With Melbourne and Sydney being the two “big” cities in Australia I will weep if I see an airport such as Avalon closed now and then needing a massive future investment in a second airport in say 10 -15 – 20 yrs time when Victorians/ Melbournians will really need one, prop it up and keep it going I say. Avalon would probably do better to entice business from Essendon and develop as a business aviation hub with maintenance and training facilities. Melbourne has ample capacity with proposals for parallel runways, although the terminal area is severely restricted by the runway layout and freeway. I hope Avalon airport will have international budget airlines like Cebu Airline and Scoot Airline to fly in and out of Avalon will be long term investment and opportunity for the people. Once you get these airlines then only other infrastructure can come in like the v-line trains and buses and hotels. Unprofitable, I don’t think so. More like a ploy to put pressure on the Vic gov’t & the airport to continue with the subsidies. Avalon has also been designated as Melbourne’s second airport, it isn’t going to close anytime soon.